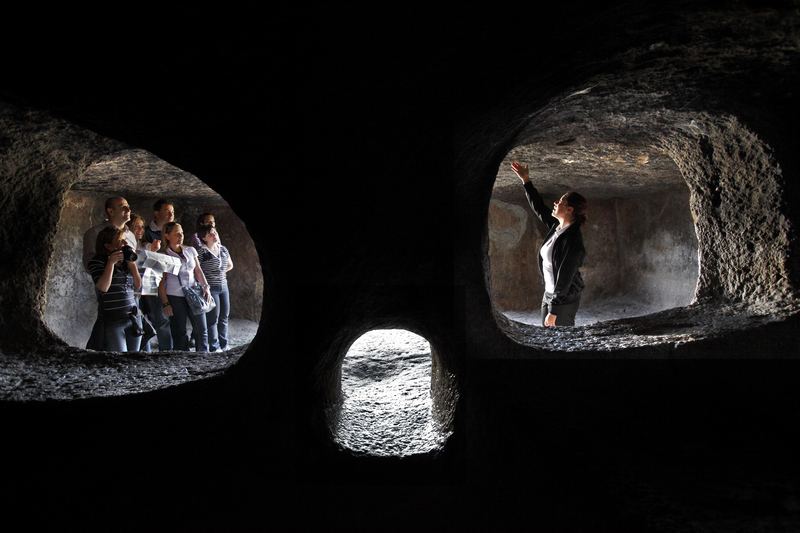 Excavated in an amphitheatre of trachytic rock on the southern side of the ‘silent’ hill of Sa Pranedda, it consists in over 40 tombs of various sizes and has a layout aligned along the rock face in a symmetrical way, according to a design that seems to have been pre-planned. 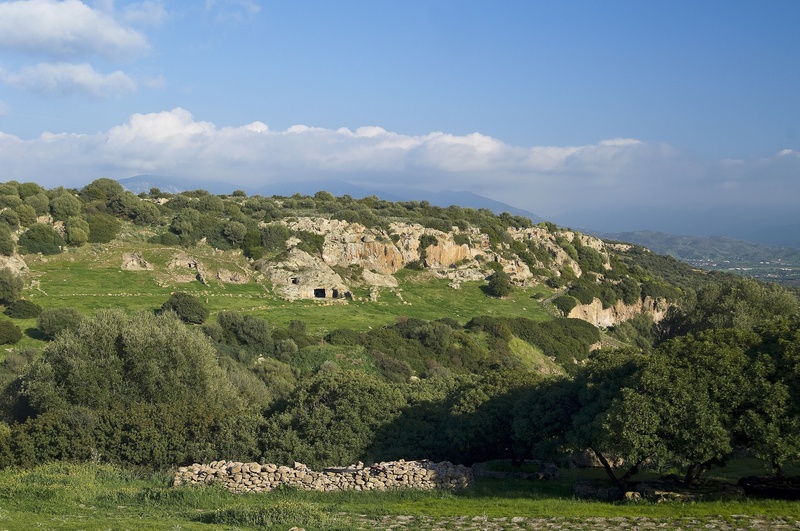 The necropolis of Montessu is one of the most significant and fascinating pre-Nuragic remnants on the island, in use for a millennium and a half, from the final Neolithic (3200-2800 BC) to the ancient Bronze Age (1800-1600 BC), as evidenced by the ceramic finds discovered and safeguarded in the archaeological museums of Cagliari and Santadi. The sheer size of the prehistoric burial ground dominates the Rio Palmas plain boarding the village of Villaperuccio in the lower Sulcis. In addition to the necropolis, the valley is home to an archaeological park including an allèe couverte, two Nuragic structures and two imposing menhirs reaching around five metres in height. 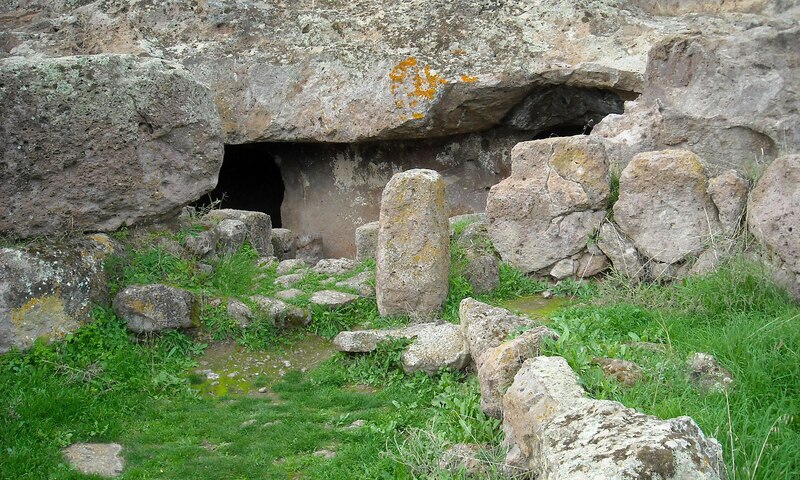 The necropolis headed a village in the 3rd millennium BC, the remains of which can be seen on the hill of s'Arriorxu. Many other perdas fittas (driven into the ground) characterise the territory, where there is another Neolithic necropolis, the Domus di Marchianna, and the ruins of 40 other Nuragic structures. From the entrance of the archaeological site, a path extends upwards for several hundred metres. Most of the Domus de Janas of Montessu are multi-chambered, formed by vestibule and a hall with a number of niches or by numerous rooms arranged in longitudinal succession, accessible through corridors and in some cases embellished by hewn columns and wall carvings. Built-in stone doors closed the entrances, which in some cases resemble a skull - a choice not made by chance. The cavities, niches and cupels served to arrange the grave goods and the remains of the deceased. The simplest burials have a chamber of one metre in diameter with a low vault. The corpse was introduced in a foetal position via a narrow little entryway. In its majesty and elaborate architecture, two tomb-sanctuaries can be distinguished at the end of the natural amphitheatre, facing the other: Sa Cresiedda (little church), the most photographed, and Sa Grutta de is Procus (pig cave), the front of which is characterised by megalithic alignments arranged in a semicircle, monumental entrances about two metres in height and a large pavilion that served as a vestibule. Three openings provide access to the mortuary chamber, split up by sturdy dividers in which open doors arranged in a spiral pattern symbolising the eyes. On the external side, there are two other domus structures that hold great significance in regards to religious symbology. They take their name from the decorative motifs, engraved or embossed, by which they are characterised - the ‘tomb of spirals’, decorated in the antechamber with wolf’s teeth in red ochre, the colour of regeneration, at the entrance by a taurine protome and, in the chambers, by festoons, candelabra motifs, a false door indicating the passage to the afterlife, and numerous spirals symbolising the eyes or breasts of the Mother Goddess. In the vault and at the entrance of the ‘tomb of horns’, which is vertically structured with an access well, features carved horns in various shapes, alluding to the god Taurus, similar to those of megalithic Britain. The position of the two pairs of tombs at the ends of the rocky semicircle reveals a pre-established layout. The monumental tombs were placed thus in order to protect the other tombs and the peaceful rest of the dead.